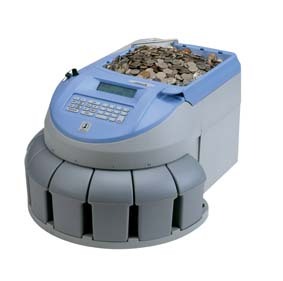 The De La Rue Mach 6 is a fast, accurate and versatile coin processor configurable for tabletop or higher volume applications requiring bagging capability. The Mach 6 is the perfect solution for medium-size bank branches, retailers, transportation authorities and small casino operations. Highly configurable, the Mach 6 can track and consolidate management information, eliminating the need for manual reporting. Utilising minimal counter or floor space, the Mach 6 can be accommodated into virtually any business environment. Its superior design offers functionality, efficiency and is ergonomically designed to enable fast processing of coin with minimal fatigue on the operator. The simplicity of the patented Figure 8 technology provides optimal and accurate sorting at up to 3,000 coins per minute. This means Mach 6 one of the fastest in its class. With the addition of the coin authentication option, utilising patented WAVE sensor technology; the Mach 6 becomes the ideal machine to assist in the rejection of intrusive or counterfeit coins. Coin authentication increases accountability whilst maintaining the highest degree of accuracy. The Management Information Control System (MICS), included as standard, provides three levels of memory and allows other media, such as cheques, vouchers or bulk coin to be entered via the keypad. Notes can be entered manually or automatically transferred if a note counter is interfaced, ensuring a comprehensive audit trail.